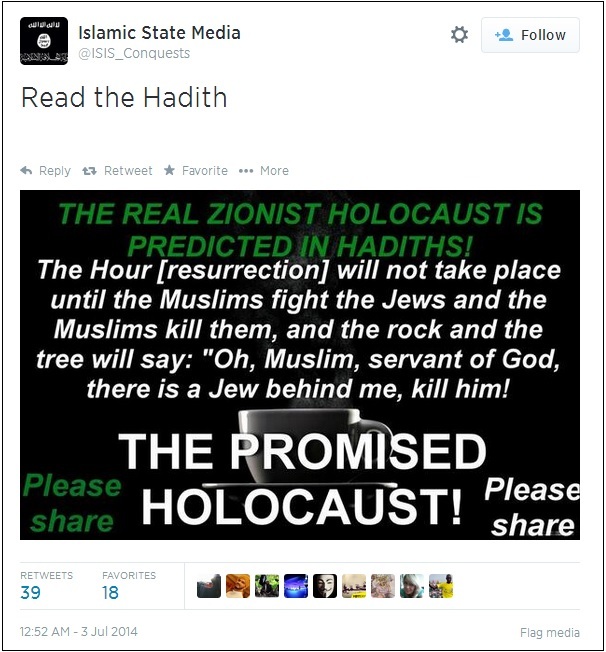 ISIS threatened a new Holocaust against the Jews on one of its Twitter accounts this week. As “predicted in the Hadiths” or teachings of Muhammad. A Twitter post Thursday by supporters of the Islamic State of Iraq and Syria (ISIS), now calling itself the Islamic State (IS), has Terrorism Ragingpromised a Holocaust against the Jews. “The Real Zionist Holocaust is Predicted in the Hadiths! The Hour [resurrection] will not take place until the Muslims fight the Jews and the Muslims kill them, and the tree will say: “Oh, Muslim, servant of God, there is a Jew behind me, kill him! THE PROMISED Holocaust,” the terrorist group’s Islamic State Media a graphic posted on its @ISIS_Conquests’s Twitter account said. This hadith has proven popular with Islamic extremists of all stripes, ranging from IS to Hamas – and even on television in the Middle East. Daniel Pipes, an expert on jihadism, said the hadith likely was a recruitment tool.